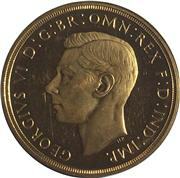 1937 George VI £5 pounds [obverse]. Image: M J Hughes Coins. The only year Gold coins were released during the reign of King George VI was in 1937, making these coins – especially the sovereign – rare and much sought after by collectors. King George VI ascended the throne on 11th December 1936 after the abdication of his brother Edward VIII. He had married Lady Elizabeth Bowes-Lyon in 1923 and the King and Queen were very popular in the era of World War II. George was a heavy smoker and died in 1952 aged only 56. He was succeeded by his daughter, Queen Elizabeth II. George’s wife then became known as ‘Queen Elizabeth, the Queen Mother’, who maintained her popularity until her death in 2002 aged 101. 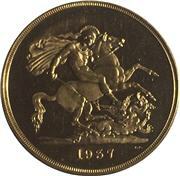 1937 George VI £5 pounds [reverse]. Image: M J Hughes Coins. During and immediately after the war years, Britain needed gold (and silver) to pay off its debts to other countries, so George VI gold coins were only minted in 1937, and then only 5,001 of each of a gold five pounds piece (£5), two pound piece (£2), sovereign and half sovereign. The original sets came in Royal Mint burgundy leatherette presentation case. All the coins had a similar design: King George VI’s head (designed by Thomas Humphrey Paget) and the reverse showing George and the Dragon (by Benedetto Pistrucci, who actually lived 1784-1855). 1937 George VI Gold Proof Set. Image: M J Hughes Coins. Over the years most sets have been broken up so as to supply Sovereign collectors with one of the harder-to-find sovereigns. Needless to say, all of these coins (individually or as a set) have a high value and the price has increased considerably over the last few years. My thanks to Max Hughes (M J Hughes Coins) for the photographs of the set he has for sale. 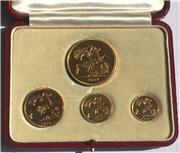 Offered For Sale Is a rare 1937 King George Vl Gold Coin Set. 1937 Press Photo The State trumpets, used in the Coronation Ceremonies.